Serrv just turned 70! But we sure didn’t do it alone. This year marks Serrv's 70th year as an organization, and we're proud of the work we've done to fight global poverty during that time. The artisans and farmers who create the beautiful handcrafts and specialized foods we sell are the soul of our business. Their commitment to creating a better life for themselves, their families, and their communities through the work of their hands is the mission of our business. Serrv employees are the brains of our operation, a committed team of professionals who work together to select, organize, ship, and market our products to customers in the United States and Canada. Our team works tirelessly to get the world's best fair trade handcrafts and foods to you, and they do so with great care and consideration. But it is your efforts that represent Serrv's heart. We wouldn't be celebrating 70 years in 2019 without the continued support and dedication of you—our volunteers, hosts, shopkeepers, and advocates. Whether you've shared our catalog with a friend, volunteered your time unpacking boxes at our warehouse, hosted a Serrv consignment sale at your church, or spread the word about what we're doing on social media, you are making a difference. And we're so grateful for your help. We can't tell the story of every one of the many thousands of people who have made such a profound difference to our organization over the past seven decades, but we can tell the stories of a few. Like you, each of these individuals has their own reasons for supporting Serrv's fair trade mission. A lifetime of service: Serrv staff helped long-time volunteer Roger celebrate his 91st birthday at our warehouse in October 2018. If we're going to talk about a single Serrv volunteer, it doesn't hurt to talk about the one who has been volunteering with us for the longest. Sixty years ago, Roger loaded a refurbished school bus with volunteers to help us ship clothing to displaced families abroad, and he's continued to rally volunteers for Serrv ever since. A retired United Methodist Church pastor, Roger has dedicated his life to serving others. A graduate of the University of Maryland and Gettysburg Theological Seminary, Roger was commissioned in 1962 as a missionary to Nigeria, where he spent six years. His work in Nigeria was varied and took him to all areas of the country, from maintenance work at a hospital to church development and pastoring. He was accompanied by his wife, Sylvia, and five of their eventual six children. Upon his return to the United States, he began work with the Church World Service's CROP program and launched the first CROP Hunger Walk in Keedysville, Marlyand, to fight global hunger. "I believe in the cause. I think we ought to help hungry people, and there's millions of them in the world," he said last year. His experience working with those in need in Nigeria influenced much of his life's work. His quote from this 1975 article may sum up his philosophy of service best: "Nigeria, and nations like her … desperately needs our help, but no more desperately than we, as the world's most affluent nation, need to help her." In 2017 alone, more than 1,800 individuals volunteered their time and energy to Serrv, from our warehouse in New Windsor, Maryland, to our store in Madison, Wisconsin. Learn more about volunteering with Serrv. A host with the most: A member of the Elizabethtown, Pennsylvania, Church of the Brethren, Karen has been hosting Serrv consignment sales for nearly 40 years. Years later, when she heard about Serrv through her church, she knew that selling handcrafts would be a way to support people in countries like those she had visited, those that did not enjoy the same advantages as those in the United States. She began hosting Serrv consignment sales at Church of the Brethren and at the Brethren Disaster Relief Auction. In 2018, Serrv consignment hosts held 350 sales, selling more than 40,000 fair trade handcrafts and foods, and introducing our products to new audiences nationwide. 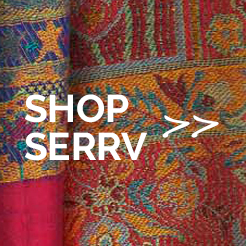 Learn more about hosting a Serrv sale. Partners in fair trade: Joan is the Executive Director of nonprofit retailer Just Creations, which has been carrying Serrv products for nearly 30 years. While all her tours have been special, the time Joan spent in Nepal has provided lasting inspiration. “I met the founders, leaders, and artisans working with Mahaguthi and ACP and was particularly moved by their commitment to empowering women and educating girls. When the earthquakes struck in 2015, these artisan communities continued to work together and to support each other through the recovery. 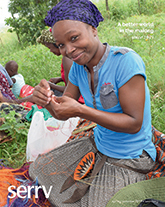 The long-term relationships that are the hallmark of fair trade made it possible for the artisans to rebuild while maintaining their employment. 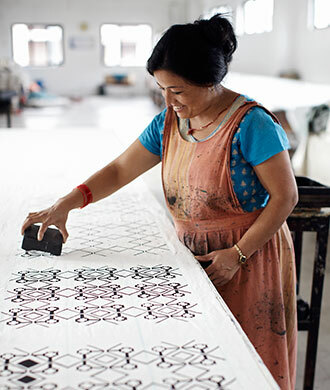 The biggest reason Joan gives for supporting fair trade? Knowing you're making a difference in the lives of so many. "And it is as easy for us as buying a pound of coffee, a chocolate bar, or a gift." Serrv wholesales its products with more than 800 retailers in all 50 states. Find a store, or learn more about wholesaling Serrv products. Family matters: Representing three generations, Ginger, Christy, and Cailin served as models for a fair trade fashion show at our store in Madison, Wisconsin, in April 2018. Our advocates support our work in myriad ways, inspired for reasons both personal and profound. For our friend Cailin, the call to promote Serrv stems from a love for fashion—and family. Along with her mother and grandmother, Cailin volunteered to model fair trade clothing at a fair trade fashion show at our store in Madison, Wisconsin, last spring. The event was held in conjunction with Fashion Revolution Week, a global event that asks consumers to think about who made their clothes—and at what cost to workers and the environment. More than a passion for fashion, Cailin is also inspired to promote fair trade thanks to her grandmother, who worked in a sewing factory as a young mom, for little pay in return. "My grandmother's mother picked cotton in the hot Alabama fields as a child to help her family survive, and her paternal grandmother worked as a tailor to support her children after becoming a widow in 1925." This family history in textiles makes Cailin think about those who make clothing around the world today. "More people are starting to pay attention to the companies they support and are making changes in the way they shop to be more in line with their own values." Advocating for—and shopping with—Serrv allows Cailin to support artful, well-made designs in good conscience. "The cash flow goes straight to the workers who make your clothes, rather than being funneled through cooperate businesses and leaving pennies on the dollar to overseas workers. These people work hard and deserve to be recognized for it. They deserve to get paid for it. They deserve to have a safe environment to work in. And that's what Serrv does." It's impossible to calculate the many thousands of those who advocate for Serrv every day—or to fully express our profound thanks for your support. Learn more about how you can get involved.